Grids constitute a promising platform to execute loosely coupled applications, which arise naturally in many scientific and engineering fields like bioinformatics, computational fluid dynamics, particle physics, etc. In this paper, we describe our experiences in porting three scientific production codes to the Grid. Those codes follow typical computational models, namely: embarrassingly distributed and master-worker. 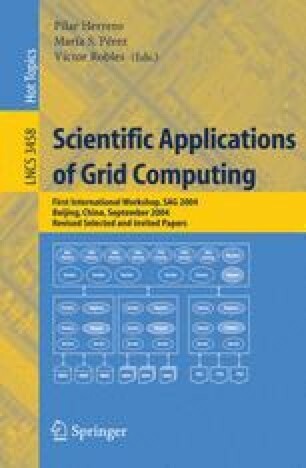 In spite of their relatively simple computational structure, consisting of many “independent” tasks, their reliable and efficient execution on computational Grids involves several issues, due to both the dynamic nature of the Grid itself and the execution and programming requirements of the applications. The applications have been developed by using the DRMAA (Distributed Resource Management Application API) interface. DRMAA routines are supported by the functionality offered by the GridWay framework, that provides the runtime mechanisms needed for transparently executing jobs on a dynamic Grid environment. The experiments have been performed on Globus-based research testbeds that span heterogeneous resources in different institutions. This research was supported by Ministerio de Ciencia y Tecnología, through the research grant TIC 2003-01321 and 2002-12422-E, and by Instituto Nacional de Técnica Aeroespacial “Esteban Terradas” (INTA) – Centro de Astrobiología.